I came across this article on how Spock and Sherlock Holmes aren’t really as rational as they pretend to be, and other characters often acknowledge them as being. 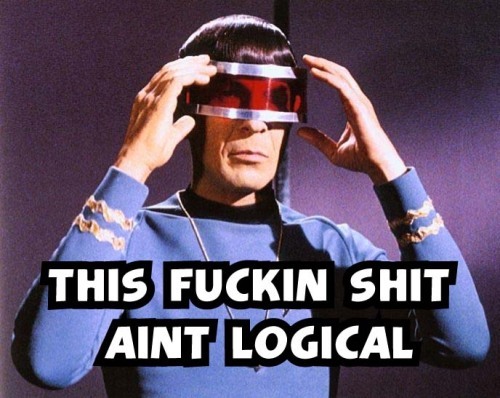 Spock applies logic to situations where it doesn’t really apply, and doesn’t explain the reasoning he used to arrive at his conclusion. Holmes uses primarily inductive reasoning, not deductive. He’s right a lot of the time because he’s a keen observer, but his conclusions are by no means certain. When examining characters such as these, I think you have to examine the authors’ intent, and this isn’t always clear. Are these characters supposed to be flawlessly intelligent and are just lazily written, or is the author challenging the reader or viewer to recognize their flaws? I certainly never got the idea that Star Trek wanted us to see Spock’s philosophy of disregarding emotions and acting according to pure reason as applicable to our own lives. For one thing, it’s probably impossible, even for Vulcans. On the other hand, I also don’t believe he was a purely negative example, a buffoon who only thought he was intelligent. Rather, he’s a smart character who sometimes makes mistakes. I’ve compared the Vulcans to Jonathan Swift’s Houyhnhnms, and as I see it, both of these purely logical societies have both pros and cons. We’re not supposed to see them as perfect, but to use our own cognitive abilities to notice the good and the bad in them. It’s also important to recognize that it’s difficult to write a character who’s smarter than you are. I doubt Sir Arthur Conan Doyle considered himself a master of deduction or the Trek writers were professional logicians, yet all examples of their characters’ abilities have to come from these writers. Part of this can be accomplished by simply not putting the characters into situations where their techniques won’t work (unless, of course, that’s the whole point of a particular story), but using this too much can probably ruin suspension of disbelief. Unless it’s a farce, you don’t want your fiction coming down to, “This character is smart because the whole rest of the world is stupid.” I remember a Dave Barry column from the 1980s saying that Perry Mason was somewhat like this, with Mason being regarding as such a good lawyer partially because the prosecutor was incompetent and the criminals always eventually admitted their guilt. Not having watched Perry Mason, I can’t vouch for this, but I think it demonstrates what I’ve been trying to say. I also couldn’t help thinking of Fred Clark’s reviews of the Left Behind books, which really DO seem to have been lazily written (the books, not the reviews). In this post, Clark writes, “We’re told that Buck Williams is a master journalist, but since the authors couldn’t be bothered to learn what good journalism looks like, we’re shown that Buck is a clumsy hack (“like saying the Great Wall of China is long”). We’re told that Nicolae is a great orator, but since the authors couldn’t be bothered to learn what constitutes good oratory, we’re shown that Nicolae is a droning bore (“Afghanistan, Albania …”).” Of course, these books are insanely popular with a certain crowd, so I guess insulting the audience’s intelligence can sometimes work. This entry was posted in Philosophy, Star Trek, Television and tagged dave barry, flaws, fred clark, gulliver's travels, houyhnhms, inductive reasoning, jonathan swift, left behind, logic, perry mason, sherlock holmes, sir arthur conan doyle, spock, vulcans. Bookmark the permalink.